Designing your dream kitchen can be a task in itself. From the design concept to the practicability of your joinery requirements. Steves Joinery use an advanced digital software program which enables us to design your kitchen and cabinetry concepts for you.Our management team are available to help with all your joinery requirements and will ensure you have the most current information, advice and products readily available for you. Below are some of the products Steves Joinery can use in the manufacturing of your kitchen & bathroom designs. Most products and materials are available to view in our workshop or can easily be ordered in for your viewing. Please see our hardware page on products used within the manufacturing of the cabinetry. Acrylic bench tops are made from high performance resins and natural minerals. A popular choice if you are wanting a seamless finish with no visible joins. Theroformed doors are a thermal laminate which is bonded under heat and vacuum pressure onto MDF board. It comes in various colours and profiles. It is a seamless product, easy care and comes in low and high gloss finishes. 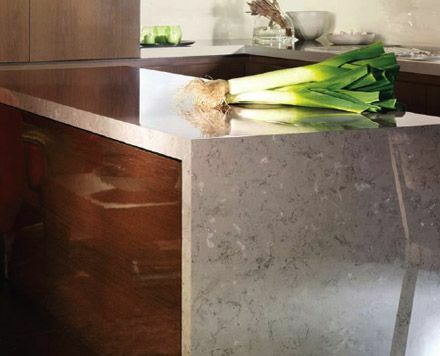 Caesarstone is one of the most popular choices of bench top surfaces. It is made of 93% natural quartz. There are numerous choices of colours available within NZ. Melamine's & Melteca are a low pressure laminate pressed onto MDF or Partical board. This product is one of the most cost effective options when designing new kitchen's and cabinetry. It's a very durable, easy clean product with a colour range to suit anyone's preferences. High pressure laminates are one of the most cost effective bench top products, it has a huge palette range including solid colours, wood grains and patterns. Textured finishes are also available as well as high and low gloss. Veneer is a thin (usually no more than 1mm ) natural timber overlay pressed onto MDF or Substrate options. Timber veneers are one of the most popular choices in kitchen joinery. choosing a timber veneer gives you that warm, natural wood feel and look. It is a unique and individual choice of product as no-one would have the same. You can choose from a huge range of natural species , and have stained or lacquered to your liking. Some choose to add a natural plank look , or white wash depending on your tastes. Veneers can create a modern contemporary look, along with vintage themes.